The MCU Avengers do fit Trump's voter demographics, but Marvel's current comic book line-up doesn't. That panel’s popularity has surged again now that the 2016 presidential election is over. Both left- and right-leaning fans have taken it to mean that digging in one’s heels against political opposition is an honorable act. Cap and the rest of the Avengers, our longstanding fictional avatars, have a history of bucking authority in their comics. Two civil wars between the superheroes have taught us that their collective response to President-elect Trump would definitely be contentious, because the group doesn’t often agree on one concept unanimously. The thing is, American presidents have a long history of appearing in Marvel comics, and all previous Donald Trump cameos have depicted him, at best, as a buffoon, and at worst, as a sadistic villain. Publishing comics in Trump’s America, Marvel will be forced to shift its rhetoric in one of two ways. 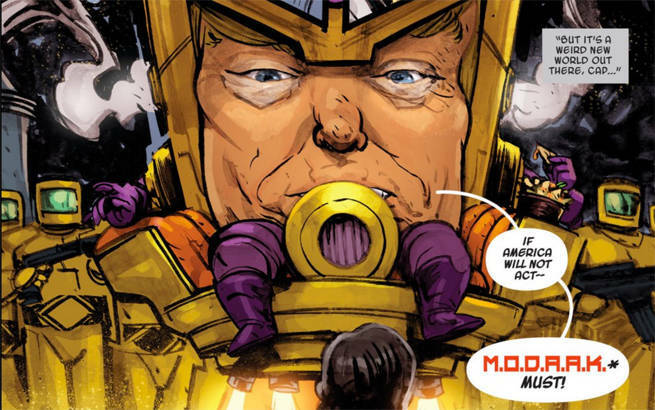 Either Marvel’s Trump will be the first comic book President depicted as a villain, or Marvel will wipe all of its previous commentary on Trump and present a new, cleaned-up version of the tycoon-turned-politician. Should Marvel choose the latter, the Avengers may be torn apart yet again by the regime shift. The Avengers, arguably, have not faced a situation quite like the current United States political climate, and they’ve certainly not had to answer to a commander in chief quite like President-elect Donald Trump. It’s also worth mentioning that Marvel’s current Avengers lineup is much more diverse than the group of older, black and white men (and two white women) featured in MCU films. They also don’t answer to the United States government — that’s the B-team U.S. Avengers, a group led by Sunspot, a Brazilian immigrant mutant. The only superhero on that team likely to follow President-elect Donald Trump happily is Red Hulk, or “Thunderbolt” Ross. 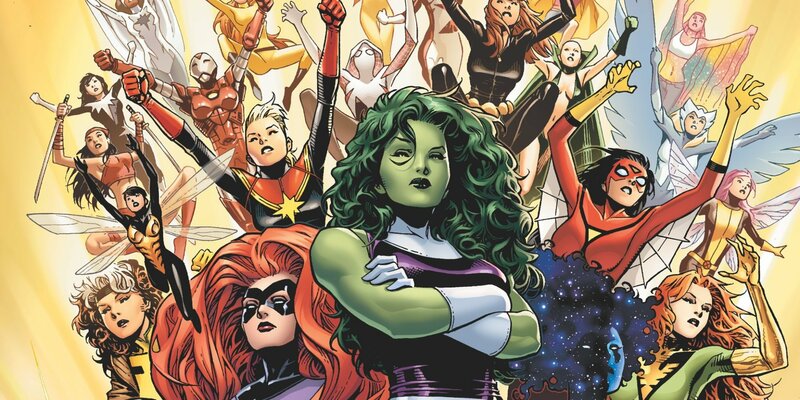 Even 'A-Force', Marvel's all-female Avengers team, is largely white. While the Avengers’s political leanings are up for grabs, the younger, more social-justice-focused Champions were created by Marvel in opposition to the values Donald Trump and his supporters hold dear. That line-up includes a Korean-American Hulk, a Pakistani-American Ms. Marvel, a young black Spider-Man, the synthetic Viv Vision, and a non-Earthling Sam Alexander, who represents NovaCorp, which is essentially an intergalactic United Nations. None of those heroes are likely to fall in line under a Trump regime, because they fight for open borders and value negotiations with enemies over combat. Even more liberal than the Champions are the Occupy Avengers, a group led by Hawkeye that focuses on wealth redistribution and humanitarian aid. The Champions famously rejected the ideals of the Avengers by burning their membership cards. Of course, analyzing each character’s motivations in-universe can only take us so far, because none of Marvel’s superheroes are real people with actual motivations. They are the creation of artists with political leanings of their own, though every artist and comic writer is only able to deliver those views as approved by Marvel Entertainment, the corporation that governs them. In the past, Marvel has adapted real-life presidential politics delicately. After 9/11 in our world, and the Stamford Incident in the Marvel universe, George W. Bush appeared in Marvel comics as stringent and demanding of superheroes. Though many of the Avengers opposed his methods, Tony Stark worked closely with President Bush in order to register and keep track of superhumans around the globe. This, of course, launched a civil war among the Avengers, which functioned as Marvel’s commentary on American political unrest in the mid to late 2000s. President Obama factored into Marvel Comics more prominently, befriending Spider-Man and being generally beloved by the Avengers as a leader. It’s not clear how much of that depiction was based on Marvel writers’ opinions, as opposed to the corporation’s data on what its loyal readers want to see. Marvel, unlike Captain “no you move” America, has a bottom line, and that’s book sales. Whether Marvel as a whole attacks Trump — using its Avengers as avatars — will depend largely on his approval rating, which hasn’t been set yet, officially.